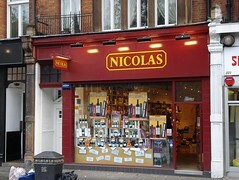 The Knightsbridge branch of reputable French wine merchants Nicolas. Opening hours taken from the Nicolas website, February 2008. Last edited 2012-04-15 19:08:39 (version 5; diff). List all versions. Page last edited 2012-04-15 19:08:39 (version 5).